The School of Information Management is pleased to announce that Master of Library and Information Studies student, Rebecca (Becky) Shaw, has been selected as the fifth recipient of the Dalhousie-Horrocks National Leadership Fund. Becky Shaw is a second year Master of Library and Information Studies student and first year Master of Arts in Musicology student at Dalhousie University. She previously studied at Western University (London, Ontario) where she received her Bachelor of Music, Honours Music History. Her main interests are in music librarianship, archival studies, and early music notation. Over the summer, she spent five weeks at the National Library of Portugal in Lisbon, describing and cataloguing chant manuscripts from the sixteenth to eighteenth centuries. Becky currently works as a Research Assistant to Dr. Jennifer Bain on the Cantus Manuscript Database, where she is developing a standard identification system for differentiae—melodic formulas that indicate the end of a psalm recitation—in over 170 medieval chant manuscripts. Her MA thesis will further explore differentiae using digital analysis techniques. Becky also works in the Dalhousie Archives and is on the editorial board for the Dalhousie Journal of Interdisciplinary Management. 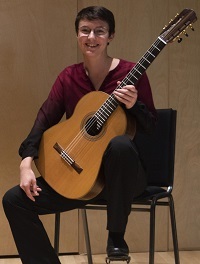 In addition to her musicological interests, Rebecca is a classical guitarist, and studied with Wilma Van Berkel at the University of Western Ontario. She holds her Associate Diploma from Conservatory Canada in guitar and piano performance, and has performed for such guitar luminaries as Rene Izquierdo, Dale Kavanagh, Laura Young, and Gohar Vardanyan. Rebecca has received several academic awards, including, most recently, a Killam Predoctoral Scholarship at Dalhousie University and a Canadian Graduate Scholarship from the Social Sciences and Humanities Research Council (SSHRC) of Canada.